As you may know, I simply love wearing t-shirts. They're versatile and an essential wardrobe piece for me, because a good t-shirt always manages to make a look younger, fresher, simple and stylish at the same time. 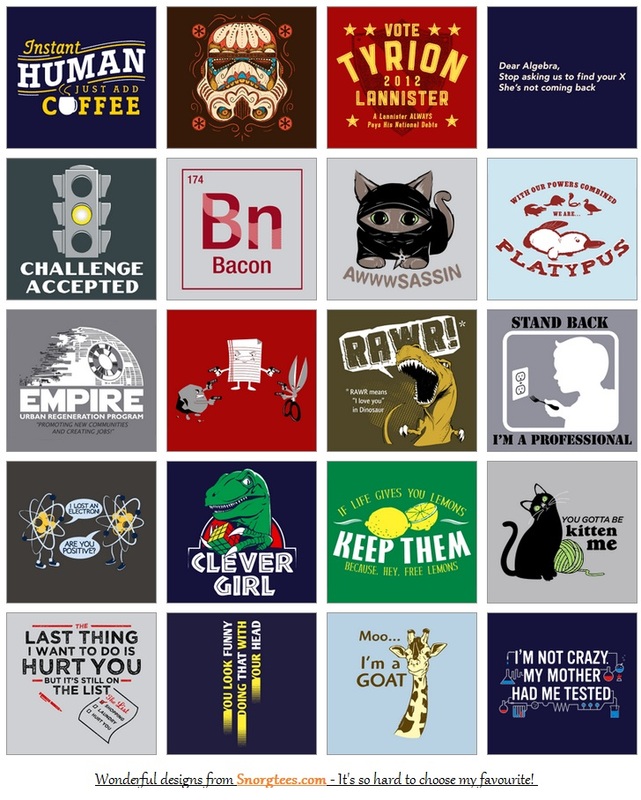 I'm going to review a T-shirt from Snorgtees.com, a cool t-shirt and apparel shop that specialize in pop-culture inspired, random, and all around funny t-shirt designs. They also sell hats, hoodies and other cool stuff! I chose to review the 'Leonardo' t-shirt because it was one of my favorite designs on the site. It just looks really graphic and the color, smoke, is one my all time top shades to wear. I really like the Mona Lisa face and her nose. The excellent design drew me to this t-shirt instantly, and many of their t-shirts have such funny slogans! Can you spot the subtle ninja turtle on the tee below ? The t-shirts come in a variety of sizes, and fits for guys, girls or unisex. The quality of the t-shirt I got is really good - top quality material and actually printed by American Apparel, soft and not overly stretchy. It's really comfortable to wear, and I would advise ordering a size up just in case it shrinks in the wash. The fabric is light too - so it doesn't weigh you down when you wear it. Perfect t-shirt for pairing with some denim shorts, or a cool black leather jacket and leggings. The cutting is good too - sleeves not too long or short. Their service is also very speedy and quick. I got my package only a week or so after I emailed an order. Considering I'm all the way across the Earth from USA right now, this is really great because it means my shirt came just in time for the cooler month of September. I actually had a very hard time choosing between their designs. They are all really well drawn, and some are really funny - there's even a section of shirts with the theme of BACON! I'm so excited to host my first giveaway ever for all of you - and what's better than it being on the one clothing item that we all own - a t-shirt! Snorgtees would love to send one blog lucky reader an awesome t-shirt, printed by AMERICAN APPAREL, choosing any from their website Snorgtees.com. They have awesome categories of tees suitable for everyone, if you are a geek, a science fan, an animal lover, movie buff or rude slogan lover - some highlights are cute panda bear, teddy bear madness, flying piglet and others in the 'Animals' category. How to win this giveaway ? 2. Visit Snorgtee's facebook page , look around ('Like' it if you want to) ! 3. Choose the t-shirt design that you would like to win from Slorgtees.com. Post the link. (OPEN TO: US / UK / Canada ONLY) If you've done this, it will be counted as 1 entry. Enter me for a tee! +6 Blog about this giveaway and let me know! 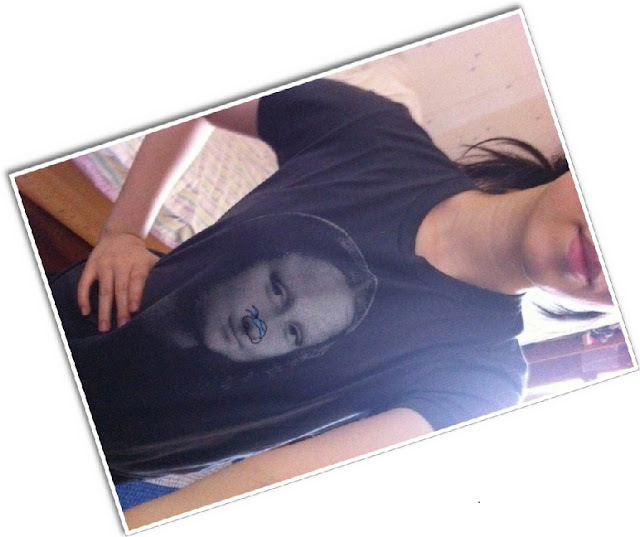 +2 Tweet "I entered @fantailflo x @snorgtees 's giveaway to win a free t-shirt! Click http:/www.fantailflo.com"
Do enter my first ever giveaway! The more tasks you do, more chances you have to win a t-shirt of your choice! This giveaway closes on the November 24th. Good luck! How adorable. Love the TEE! Extra entries: - Following on Twitter @SS_Summer. The tee's are super cute! T-shirt of choice: tough choice really: "Choose Wisely"
+1 I follow you via Bloglovin. Extra entries: follow! and like! thinking about using the Tripod platform. Do you consider this is a good foundation to start with? Hey. I noticed your site title, "Blogger: fantail flo" does not really reflect the content of your internet site. want the best quality for my visitors. A corset is a garment worn to hold and shape the torso into a desired shape for aesthetic or medical purposes (either for the duration of wearing this item, or with a more lasting effect). Both men and women are known to wear corsets, though women are more common wearer. It's really nice for anybody to own many products from their preferred fashion YSL outlet, but is certainly not just about all nice to get to pay a lot for the entire group.There are several as well as tricks to pay for less and to have more for brands.If would like a guaranteed authentic designer item, check out the designer's own shop with involving funds to cover your ordering. Anything on eBay priced too good to be true probably is.Buying a Realtree camo designer handbag is more of an investment than just some thing to carry your daily necessities. Styles and fashions improve continuously but despite the fact that buying a Realtree camo designer purse may set a gap with your discounts account you may be confident that it will final you a life span.A good deal of view is the YSL handbags outlet fact Realtree camo purses are only for the wealthy and well-known.It might be a minor overwhelming to try and opt for the best bag from amongst the multitude of alternatives of luxurious designer purses obtainable available on the market currently.It is no speculate that countless thoughts occurs about true designer handbags, purses as well as baggage with regard to their proper usage. Believe it or not, one among essentially the most reviewed questions is on what type of designer handbag to purchase for any job interview.Handbags are the most important fashion accessory for women. Typically, women have a wide range of handbag collection for different occasions and to match their outfit. No matter, if you are going for a party, to YSL outlet handbags office for simple for a hang out with friends, you would need to carry a good handbag to suit your style, personality and the event. If you have a fetish for handbags and wish to go online handbags shopping, the following tips will greatly help you. Sakara and Rivera are now well enough to go at it in UFC 122.
regards to technique, and tournament results.